We’re less than a month away from the release of the Majora’s Mask 3D remake, meaning lots of new details and photos will be shown over the next few weeks. And so far, we’ve been getting overwhelmed with new details, from the changes that will occur in the remake, to the new features given for the New Nintendo 3DS. Within the last few weeks, the Official Japanese Twitter for The Legend of Zelda has been sharing a decent handful of new screenshots, and you can check them out after the jump. Below you’ll find a few screenshots the Japanese-Twitter has published. They’re all taken directly from within the game, so enjoy taking a look at a few of these! You can check out the Twitter account above, and below. What did you guys think? 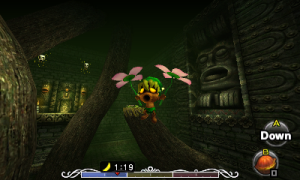 Is Majora’s Mask 3D shaping out to be what you’d hoped for? Or is it straying from what you’re original ideas were? Are you planning on getting it, or the New 3DS; maybe both? Let us know in the comments!